UK scores worst in electoral integrity in Western Europe. Here’s why. Issues of electoral malpractice have received growing attention in the UK. The Commons Library briefing on Electoral offences since 2010 gives details of the reports published by the Electoral Commission and the Associations of Chief Police Officers on cases of alleged malpractice. Questions have arisen over insecure postal ballots , proxy voting, and fraudulent practices. The Electoral Commission  issued warnings of potential ‘ethnic kinship’ voting in British Pakistani and Bangladeshi communities, a practice thought to make these areas particularly vulnerable to electoral fraud. Sir Eric Pickles, the Government’s Anti-Corruption Champion, has reviewed electoral fraud to make recommendations on what could be done to tackle the problem. Dominic Grieve , the former attorney general, has claimed that electoral fraud is a ‘growing phenomena’ in British elections. The UK General Election on May 7th 2015 certainly generated several media reports of alleged malpractices and shortfalls. On polling day, technical glitches were reported in Hackney and Dorset following problems with the electoral roll and distribution of cards for the incorrect polling station, blamed by officials on information technology and printing errors. Bournemouth council apologized after 100 people were unable to cast their vote in the local elections because an administrative blunder had led to the wrong ballot papers being issued. Earlier 250,000 ballot papers went missing after a printer’s van was stolen in Eastbourne and Hastings. 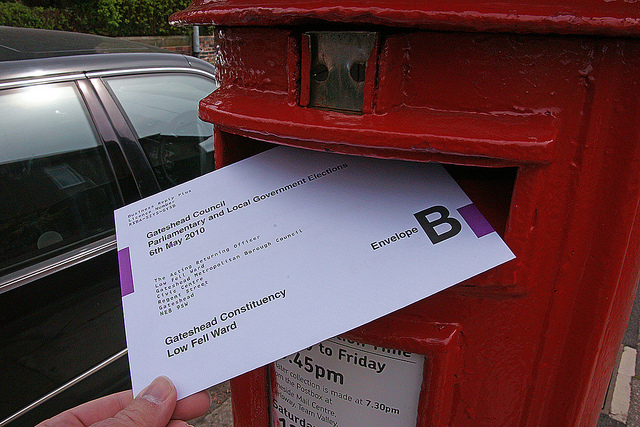 The Electoral Commission investigated complaints that some overseas voters had not received their voting packs in time. The Guardian reported that Metropolitan police received 18 allegations of electoral fraud in the run up to polling day. In Tower Hamlets, the High Court suspended the Mayor, Lutfur Rahman, after he was found guilty of falsifying postal votes and putting undue pressure on voters at polling stations during the 2014 local and European elections. In Darlington, the BBC reported that the UKIP candidate’s name was missing on ballot papers. Finally, the Telegraph reported that the Scottish Tory party leader tweeted claims of voter intimidation in Dumfriesshire, Clydesdale and Tweeddale, with the allegations investigated by local police. None of these were major issues, compared with problems common in many other countries, but they may still have undermined public confidence in the electoral process. When asked beforehand in the British Election Study , the majority of citizens expected that the election would be conducted fairly, but almost one fifth (18%) thought that it would be unfairly conducted. But are media reports and political claims of fraud exaggerated? How does the quality of UK general elections compare with other established democracies – and indeed worldwide? New evidence to give insights into this issue has been gathered by the Electoral Integrity Project . The 2015 annual report compares the risks of flawed and failed elections, and how far countries around the world meet international standards. The report gather assessments from over 2000 experts to evaluate the perceived integrity of all 180 national parliamentary and presidential contests held between 1 July 2012 to 31 December 2015 in 139 countries worldwide, including 54 national elections held last year. Forty experts are asked to assess each election, using 49 questions, with an average response rate of 30%. The overall 100-point Perceptions of Electoral Integrity index is constructed by summing the responses. To summarize the evidence, Figure 1 illustrates the contrasts in the overall 100-point PEI index for all the countries covered in the survey since 2012, divided by global region. The results show that the May 2015 UK general election scored the worst of all West European states, ranking only 39 out of all 139 countries worldwide. By contrast, Scandinavia is rated most highly in overall levels of electoral integrity, not surprisingly given the long history of democracy in the region. The rankings in PEI worldwide are led by Denmark, Finland, Norway and Sweden – which also do well in most standard indices of the quality of democratic governance. The UK scores around 20 points less on the 100-point PEI Index than the top ranking Scandinavian states. At the same time, however, contrasts are observed even among similar European Union member states and post-industrial societies; Mediterranean Europe usually performs less well than Northern Europe. Worldwide the UK also performed less well than many newer democracies, such as Estonia, Lithuania, Uruguay and less well than comparable Anglo-American democracies like Canada, New Zealand and Australia, with the important exception of the United States. But what were the weakest stages? Contemporary debates have claimed that the problem is voter fraud. Yet Toby James and Alistair Clark  argue that in fact voter registration procedures are the greater problem, based on a survey of poll workers and electoral officials in local government. The UK results in PEI can be broken down in more detail to compare each of the eleven stages of the electoral cycle, in Figure 2. The results show that the UK was seen by experts to perform poorly on electoral laws, constituencies boundaries, and media coverage (especially fair and balanced newspaper reporting). By contrast, the voting, results and count stages (where fraud might emerge) are relatively positively rated by experts, lending support to the argument by James and Clark. The poor marks given for the fairness of electoral laws is likely to tap into ongoing controversies about the electoral system. Despite considerable debate in recent decades over electoral reform, and many other systems in use within the UK, the electoral system for Westminster continues to use the plurality ‘First-past-the-Post’ system with 650 single member constituencies. Alan Renwick  used three indices to demonstrate a consistently high level of disproportionality in UK general elections since 1974, when the Labour-Conservative two party system broke down, and the 2015 contest was no exception. In general, the UK Independence Party did particularly badly in its votes:seats  share in this contest (with almost 4 million or 12.6% of the nationwide vote share and only one MP), as did the Liberal Democrats. By contrast, with just over 9 million votes, Labour racked up 232 MPs. In the global comparison, elections with majoritarian systems generally performed worse in PEI than those using PR. Other current debates in the UK concern the procedures used for voter registration , although this was not highlighted as an issue of major concern by the PEI experts. The James-Clarke  survey suggests that the electoral register needs attention: they found that over two thirds of polling stations turned away at least one citizen from voting in the 2015 election because their name was not on the electoral register. The Conservative government has recently introduced individual voter register, replacing household registration, a reform justified by ministers as a more secure system guarding against alleged voter fraud . Nevertheless, critics charge that this may discourage participation  by several sectors of the electorate, such as students and ethnic minorities. Last month, the Electoral Commission  reported about 770,000 names had been removed from the register as the government introduced the requirement that people sign up as individuals rather than as households, leading to Labour complaints about the risks of disenfranchisement. The critique of unfair or imbalanced newspaper coverage in the PEI survey also reflects long-standing debates in British political communications. Systematic evidence confirms this pattern continued in 2015. Loughborough University  produced the most thorough content analysis examining campaign coverage in ten major daily papers during the UK campaign. The results suggest that according to ‘stopwatch balance’ (how many column inches were devoted to quotations from spokespersons in each party) there was a strong bias towards the Conservatives, with Labour coverage in second place. For example, 45% of all quotation space was given to Conservative spokespersons, compared with 30% for Labour and around 11% for the Lib Dems. The balance of positive/negative coverage was less pronounced except for a negative bias towards the SNP. Therefore, the PEI results do suggest that there are familiar issues about the quality of elections which should concern the Electoral Commission. The Westminster system is perceived by election experts to perform poorly compared with many equivalent Continental Europe and Scandinavian democracies. The problems highlighted may not be particularly surprising to long-standing observers of British elections. But for Westminster to do worse than new democracies like Benin, Estonia, and Costa Rica suggests more deep-rooted cause for genuine concern. Pippa Norris is the McGuire Lecturer in Comparative Politics at Harvard University, ARC Laureate and Professor of Government and IR at the University of Sydney, and Director of the Electoral Integrity Project. She tweets @PippaN15.